I just re-read Sarah's post on community from last week. It is a great reminder of all that community has to offer and the challenges it poses. Every new person in community brings the entire community to a new place. When we first gather, there is a freshness and a delight in exploring shared values and expectations. We get to know our housemates and we begin to share the big and little things of every day life. We hold each others hopes and dreams, we share our joys and divide our sorrows. As time wears on, we discover each others foibles and rough spots. We also discover simple differences in approach to our shared spaces - often the kitchen is a focal point of these differences. We all grew up in a home where things were done in a certain way. Then we've lived in other homes where we continued these practices. And then we meet others who do things differently - often not better or worse, but just differently. In this way, we can disrupt each others' comfort level and these little inconveniences on top of life's other challenges can become much bigger than they need to be. These little things challenge us to live Gospel love. It isn't much to ask to adjust our expectations so that we can all live in relative peace. And at best, it is itself a peace-building practice that can be a prayer for peace in our broader society and in our world. As Sisters of St. Joseph the kitchen holds a special place. 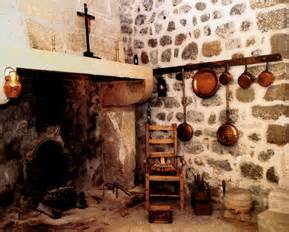 There is still a kitchen in Le Puy, France that is the site of our first community in 1650. Likely, it was the only room the community had. They prepared meals there, they also shared prayer and conversation there. They had cots that they rolled out to sleep on at night, with the coal and ashes of the fire to keep them warm through the night. Even today, a kitchen is the place of warmth, preparation, lingering conversations as we prepare our meals and clean up after them. It is also the place where we can give expression to personal and cultural differences. These differences can be a richness, they can also be a challenge. Over time, a community can become comfortable, like an old pair of shoes. You know what to expect, you know how to respond, and how to approach more sensitive topics. A good community is this comfortable place that can also be challenging. It's also important that a community have an openness to new life, to new members. After years of living together, we can come to a place where we've negotiated all those tricky kitchen issues. We can settle into a new level of comfort. Then we face new challenges. One the one hand, our community can deepen. We are called to be more open and forgiving of ourselves and of each other. Some little things become bigger things over time, as we face other challenges individually and as a community. The other challenge we can face is that of becoming more insular. We can still open our house to guests, but we have more trouble when they want to move in and disturb our settled routine. In religious life, we often invite newer sisters to live in communities that have been together for years. It is a big challenge for the veteran sisters of the community to allow this to shake them out of their comfort zone, to raise again all those tricky kitchen issues that they have long settled. Can we welcome new foods into the kitchen, new spices into the spice rack and a new coffee cup onto the shelf? Can we welcome this as an opportunity for house cleaning, and breathing newness into our settled lives? I am so grateful that over the years, I have found communities that have been able to welcome me, and I in turn have committed to welcoming others to deepen community together in the kitchen.